Lia (Sophie Neveu) goes to the feating hall to meet up with Siegfried (JauntyHat) and King Birchell (Klaymen) and his daughter (Cerhiunnhn). 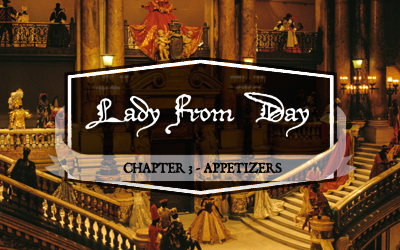 Lady from Day is a 4-Part fully casted audio drama about an adventurer Lia (Sophie Neveu) and her group of companions and their quest to save the princess Daschl Feyris (Cerhiunnhn) from her malady that is causing the kingdom of Feyris to go into famine. Lia, her counterpart Siegfried (JauntyHat) roam Feyris and the outlying regions in search of a cure for the princess. Through their journey they meet up with some unexpected people and encounter some horrible creatures.